This warm salad is perfect for your winter night. Chock full of high folate and high antioxidant ingredients, you may actually feel yourself getting healthier as you eat it. And you will enjoy every bite. Roasting vegetables brings out their natural sweetness. Try it with ANY vegetable to make it delicious (or just plain tolerable in some cases). For greens, preheat oven to 400 degrees. In a large bowl toss prepared greens with olive oil, seasoning salt, and pepper. Transfer mixture onto a large baking sheet and spread evenly, placing kale leaves toward the center of the sheet. Place sheet on middle rack of oven and bake for 20-25 minutes, checking and flipping vegetables every 8-10 minutes to ensure kale does not burn. When Brussels sprouts are soft, remove from oven. For drizzle, add olive oil to a small saucepan and heat over medium-high heat. Add shallot and saute until softened. Add balsamic vinegar and whisk in mustard and honey. Heat to a low boil for 8-10 minutes, until mixture has reduced to coat the back of a spoon. Remove from heat. To serve, place roasted greens in a large serving bowl and drizzle with balsamic mixture. Chicken soup is the typical food RX for a cold. Why? Not sure. A veggie soup would make much more sense. The antioxidant content of the veggies will help your body to fight inflammation, thereby assisting your immune system (theoretically). These veggies will provide you with a variety of antioxidants, giving you the boost you need! In a large soup pot, heat olive oil over medium heat. Add minced garlic and saute until fragrant. Add sliced leeks, kale and red pepper and saute until slightly softened, ~4 minutes. Add canned diced tomatoes and vegetable broth and heat to a simmer. Add chopped tomatoes, dried basil, and black pepper and reduce heat to low. In a large pot of boiling water, cook elbow macaroni until al dente, ~ 6 minutes. Drain and rinse, then add noodles to soup. Simmer on low for 5-6 minutes prior to serving. Put on your flip flops and pretend that summer is right around the corner! This light dessert will take you to the Keys. Preheat the oven to 325 degrees. Use an electric mixer and beat the egg yolks until they are thick and turn to a light yellow. Add the sweetened condensed milk. Mix on low speed and gradually add 2 Tbsp of the lime juice. Once the juice is incorporated add the other half of the juice and continue to mix until blended (just a few seconds). Add the grated lime peel and stir in by hand. Pour the mixture into a large liquid measuring cup. Place four ramekins in a deep baking dish, then pour warm water into baking dish so that the water comes halfway up the ramekins (be careful to keep the insides of ramekins dry). Pour the lime mixture evenly between the cups. Cover the dish with a sheet of aluminum foil. Put the baking dish in the oven and bake, until the custards are just set in the centers, ~12-15 minutes. Do not overbake. Remove the dish from the oven and carefully remove pots from the water. Cover with plastic wrap and refrigerate until chilled and set, ~2 hours. Heat 1/2 cup whipping cream in a small saucepan over medium heat just until hot. Gradually stir at least half of the cream into egg yolk mixture, then add back into hot cream in saucepan and stir. Cook over low heat about 5 minutes, stirring constantly, until mixture thickens (careful not to boil). Stir in baking chips until melted. Cover and refrigerate about 2 hours, stirring occasionally, just until chilled. Beat remaining 3/4 cup whipping cream in chilled medium bowl with electric mixer on high speed until stiff. Fold refrigerated mixture into whipped cream. Set aside until ready for assembly. To assemble: Remove chilled ramekins with custard from refrigerator and spoon mousse evenly onto the top, spreading with the back of a spoon. Return to refrigerator for additional 1-2 hours. To serve sprinkle each with graham cracker crumbs. Even as a Montana native, I do realize what Fat Tuesday is all about. Indulgence, right? But if you have been trying really hard to make healthy lifestyle changes in the new year, why blow it all for one day if you don't have to sacrifice any flavor by eating healthy? Po'boys can be 80s IF you reduce the amount of white flour involved, which translates to no chewy baguette. Use a tortilla and you can still have all of the spicy cajun flavor, but less dough. Mix together cajun boil, paprika, and crushed fennel seeds. Preheat grill or oven to 400 degrees. Rub each tilapia filet with 1/2 tsp olive oil, then liberally rub in half of the seasoning mixture into each filet (both sides). Wrap each filet with a double layer of aluminum foil. Place filets on grill or in oven for 12-15 minutes, until fish is flaky. While fish is cooking, whisk together sauce ingredients and place into refrigerator until ready to use. To serve: place two lettuce leaves into the middle of a tortilla. Spoon on 1 Tbsp aioli onto the leaf, then top with cooked filet. Sprinkle with chopped tomatoes and additional 1 Tbsp aioli. Wrap tortilla around ingredients and serve! This Valentine's Day if you really care about the one that you love, do something for their heart. This does not include buying them chocolates and flowers. Get them inspired to exercise! Couples who exercise together have as much as a 90% chance of sticking with it! In addition, partners who exercise together are more connected and spend more quality time together. 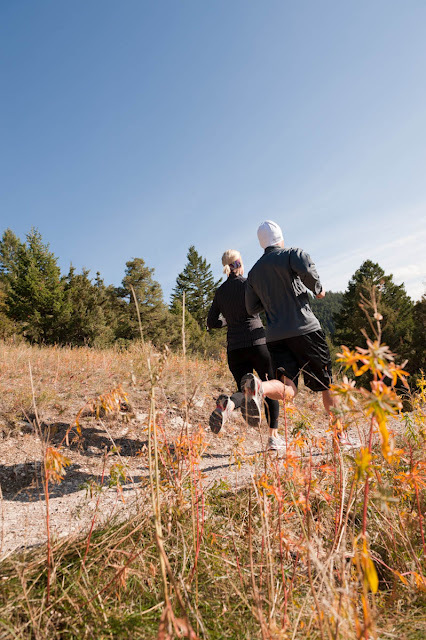 If exercising outdoors, doing so with a partner is also more safe. Try walking or jogging together, or signing up for a fitness class. There are many strength exercises that can be performed with a partner, or try a "work in" set where partners switch with each other between sets. No matter what you do for exercise, involve your partner! Ensure that the two of you can spend a long and healthy lifetime together. I made these for my sweetie in lieu of Valentine's Day. He was totally sketched out at first..... he doesn't do the salty/sweet thing very well (odd). But when he gave them a try he called me a "rockstar". I'm pretty sure he meant it in a good way. For salsa, combine all ingredients in a covered dish. Use a spoon to gently mix, cover and place in refrigerator for at least 20 minutes, or until ready to serve. For chips, heat water to a low boil in a double boiler over medium-high heat. Reduce heat to medium and add chopped chocolate. Use a spatula to keep pieces in the middle of the pot. Stir frequently as chocolate melts. When chocolate has melted dip tortilla chips into chocolate, covering half of one side. Place dipped chips chocolate side up onto a piece of parchment paper. You may need to use a spoon to spoon chocolate onto the last few chips when amount decreases. When all chips have been dipped, set aside to cool for 10 minutes. When chips have cooled and chocolate has hardened slightly, transfer chips to a plate and place in the freezer for 3-5 minutes to allow chocolate to finish hardening. Remove and serve immediately. My hubby loves those certain brand-name cookies that you purchase in a refrigerated package, ready-to-bake, and containing some sort of holiday image in the dough. Are you following me? I am not sure where he gained this love. I surely have never purchased them for him. Ok-- maybe I did once or twice but only because he asks nicely which is why he doesn't get to go to the grocery store with me anymore. No more Pillsbury cookies (FYI: two of these cookies contain 2.5 g of trans fat-- unacceptable!). My version are made with natural ingredients and no artificial dyes-- therefore, they get an ish behind their 20. Combine butter, sugar, eggs and vanilla in a large mixing bowl. Use a handheld mixer to combine, then add baking soda and mix well. Add flour and salt and mix until coarse crumbs are formed. Form the dough into two balls, then roll the balls out into 16" logs. Cover each log with plastic wrap and refrigerate for 2 hours or overnight. When ready to bake, preheat oven to 305 degrees. Slice each log into 1/3" slices. Place slices 2" apart on a baking sheet and bake one sheet at a time for 8-10 minutes, until edges are slightly golden-brown. Use a thin spatula to transfer cookies to a cooling rack. Repeat with remaining slices. In a large saucepan over high heat, boil cranberry juice for 10-15 minutes, until reduced to ~1/2 cup. Remove from heat until ready to use. To place hearts on cookies, use a small pastry brush or spoon to create hearts on each warm cookie. Allow to set for ~5 minutes prior to serving. Here's a lovely healthy breakfast to break your Super Bowl binge. It's so basic but so tasty and nutritious. In a large skillet over medium high heat, add olive oil and onion and saute ~3 minutes. Add cubed yams and allow to cook for 15-20 minutes, flipping frequently to prevent cubes from sticking or burning. Stir in salt, pepper, red pepper and baby spinach leaves and saute until leaves are wilted, 4-5 minutes. Reduce heat to low and cover. Heat a separate nonstick skillet over medium-high heat. Crack eggs, separated, into skillet and cook until desired consistency. Slide cooked eggs into hash skillet and sprinkle with salt and pepper. Serve! We all need a bit of sunshine this time of year, don't we? These will take you to the islands! This is a bread recipe of my mom's that I have health-ified a bit. Pineapple is a wonderful source of vitamin C, bromelain, manganese and thiamin, all great nutrients for reducing inflammation and assisting the immune system. In a small saucepan over medium heat melt butter. Stir in 3/4 cup crushed pineapple (drained of juice) and brown sugar. Continue to heat over medium-low heat, stirring frequently, while remaining muffin mixture is prepared. In a mixing bowl, whisk together remaining 1/2 cup crushed pineapple, olive oil, applesauce, egg whites, sugar and vanilla extract. In a separate bowl, combine flours, baking soda, cinnamon, and chopped nuts. Fold flour mixture into liquid mixture, stirring only until moistened. Gently stir in grated carrots. Spray the cups in a muffin tin generously with baking spray (without flour). Spoon ~1 Tbsp warm pineapple mixture into the bottom of each cup, spreading evenly. Spoon muffin batter on top of pineapple mixture, filling each cup ~2/3 full. Bake muffins for 18-20 minutes on middle rack, or until a toothpick inserted into the center comes out clean. Remove from oven and use a sharp knife to run around the edges of each muffin. While muffins are still warm, turn tin over onto waxed paper to release muffins. Serve warm or store in an airtight container. How about a last minute healthier Super Bowl recipe? I know, I know. Bacon? An 80? I typically feel the same way. But here's the deal: Bacon can add a LOT of flavor to a dish with just a small amount. You can totally omit the bacon in this recipe and it is still good but give it a shot-- it's worth it! In a small nonstick skillet, saute onion over medium heat until softened (you may use olive oil spray if desired). Add all ingredients into a large food processor and puree until well-combined.